PRODUCT AND LIFESTYLE PHOTOGRAPHY for catalog, web and advertising purposes make up the bulk of our in-house photography. Need product photography? Be sure to ask us about our reasonable per product rates which include color correction, outlining and a CD archive of your images. 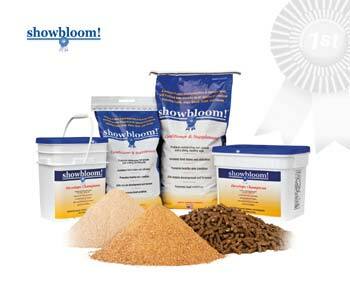 Challenge: Showbloom!, a feed supplement manufacturer, needed to add some shine to their product's image with new photography. Solution: Taking inventory of the client's current products, HSMG shot individual, group and detail product photographs. For each shot we carefully attended to lighting, focus and camera angles that would produce the highest quality images. After color correcting the photos, we outlined each product so that the images could be best utilized on a wide variety of backgrounds. Need product photography? Be sure to ask us about our reasonable per product rates which include color correction, outlining and a CD archive of your images. Challenge: Sunni Chernega needed help positioning a western pleasure prospect for show ring success and profitable resale. 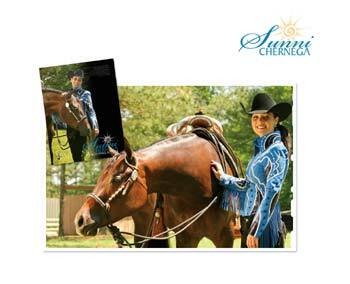 Solution: Capturing the essence of both Sunni and her horse, Heza Macs All Star, HSMG did a location shoot to provide the fuel needed for fresh ad creative year-round. Advanced photo editing made every shot a winner. Ears not up? Eyes closed? Not a problem! A CD collection of color corrected photos was given to the client for her archives, while we took her favorite photo and produced a new ad for publication.